Kyphoplasty is a minimally invasive surgery which is recommended by your surgeon if you are dealing with a spinal compression fracture. A spinal compression fracture is a condition which may occur in one of your vertebrae and the result is your weakened bones from osteoporosis. In this type of fracture, the height of your vertebra is normally reduced by 15-20%. The most common place where the compression fracture occurs is the thoracic region of your spine (which is highlighted in purple color in the below image), but there are chances that a fracture may also occur in your lumbar spine which is your lower back. What is the purpose to perform Kyphoplasty Procedure? Kyphoplasty is a procedure which is performed to restore some of the lost vertebral height. It also stabilized the fractured vertebra. This procedure eliminated the associated back pain. Kyphoplasty is considered as a minimally invasive surgery as your surgeon will perform this procedure by making a small skin puncture rather than a larger incision. How the surgeon prepares the patient for kyphoplasty? Before the surgeon at the hospital under Spine Surgery India, prepares the patient for kyphoplasty they will advise the patient to quit or reduce their unhealthy behaviours, such as consumption of alcohol or tobacco. According to the study, the use of tobacco may reduce the chance for bone healing after the procedure. The surgeon may also advise the patient about a week or so before kyphoplasty to quit some medications temporarily until after the procedure, such as non-steroidal anti-inflammatory drugs (NSAIDs) or blood thinners. As these are the medications that might increase the risk of complications during the procedure, such as the patient may experience difficulty while taking anesthesia or there are chances the bleeding could be increased. Final decisions about quit the medications can vary depending on a patient’s individual needs and risks. It is recommended not to eat food or drink at least 6 hours before the kyphoplasty procedure. A small amount of water may be allowed up to 2 hours before surgery. How the Kyphoplasty procedure is performed? a) In the first step, the surgeon at the hospitals under Spine Surgery India asks the patient lies face down on a padded table. Then the other staff member will thoroughly clean the patient’s back where the needle will be placed. After that, the surgeon will give the local anesthesia and light sedation, which typically allows the patient to remain awake throughout the procedure without feeling pain. The patient may not remember the procedure afterward. b) In the second step, the surgeon will make a small incision in the patient’s back through which a narrow tube is placed. The surgeon will use fluoroscopy (x-ray guidance) and push this tube carefully along a path through the pedicle of the involved vertebra and into the fractured area. c) In the third step, the surgeon will insert a special balloon which is known as called a bone to tamp through the tube into the patient’s vertebra and gently inflated. As the balloon inflates, it will compact the soft inner bone which will create a cavity inside the vertebra and will return the vertebral body to its natural height. d) In the fourth and last step, the surgeon will remove the balloon and then they will use a specially designed instrument through which the cavity is gradually filled with a cement-like material called polymethyl methacrylate. After being injected, the pasty material the patient’s bone became quickly hardens and stabilized. 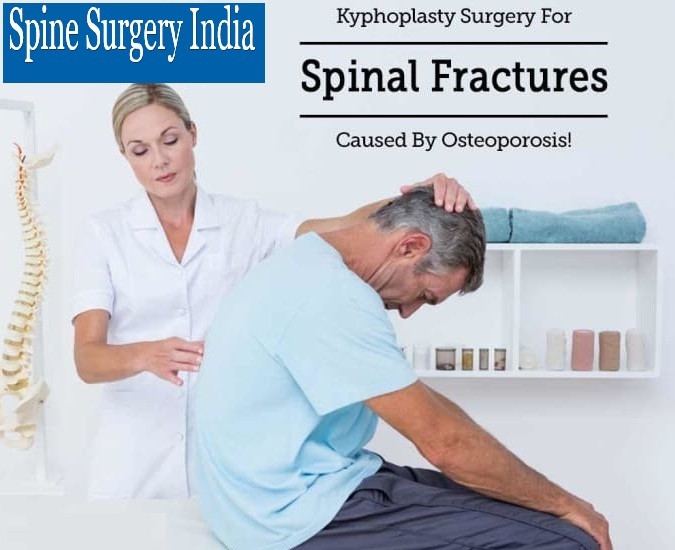 Once the kyphoplasty procedure is completed, the patient is observed closely in a recovery room by the surgeon and other staff members at the hospitals under Spine Surgery India for an hour or two. If the surgeon found that no complications are developing during this time, then they allow the patient to go home. After the procedure, the surgeons will advise the patient not to drive soon after surgery, in such cases, the patient’s need to arrange their ride home before the procedure. In some cases, patients get relief of the original back pain immediately after the procedure; however, there are cases where elimination or reduction of pain is reported within 2 days. After the kyphoplasty procedure, the patients can resume their normal activities but with few restrictions as recommended by the surgeon. The surgeons at the hospitals under Spine Surgery India suggest the patient avoid the hard exercise, heavy lifting of objects etc. at least 6 weeks after the surgery. The patient can resume their driving with the permission of their surgeon after few days or a few weeks of the kyphoplasty surgery which will mainly depend on the patient’s medications and health status. A follow-up appointment may be required after a few weeks of the procedure to ensure that the recovery is going as planned. Who required the kyphoplasty surgery and why only Spine Surgery India for kyphoplasty? The patients who are experiencing painful symptoms or spinal deformities from recent osteoporotic compression fractures are the people who required the kyphoplasty surgery. This is a procedure which will be completed within 8 weeks of when the fracture occurs for the highest probability of restoring height. The people across the globe prefer to have their kyphoplasty surgery at the hospitals under Spine Surgery India, the leading medical tourism company because here they get the reasonable cost of the treatment with highest success rates and the surgeon under these hospitals will never compromise the quality of the treatment. They will always provide the treatment which is best for the candidate and also suits their pocket. The aim of the surgeons at the hospitals under Spine Surgery India is to offer the best services to each individual so that they can live a better and improved life. This is the reason that people in larger number visit Spine Surgery India for their treatment. Are you in search of Endoscopic spine surgery in India?? ?